Hungry and driving back to Ontario from San Bernardino on the 210 recently, I exited at Sierra to look for a lunch spot. I was delighted to see a sign for Tio’s on a building backing up to the offramp. Pay dirt. 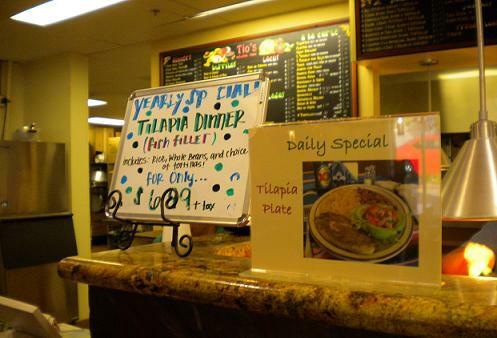 Tio’s has two locations in Rancho Cucamonga and serves pretty decent Mexican basics, quickly, cheaply and in moderately snazzy environs, much as Felipe’s used to do. 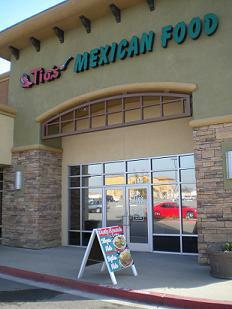 The Fontana location is in the same mold. Despite its shopping center locale and order-at-the-counter ethos, the dining room has some tiled tables (and some not), moody lighting, dark wood and non-cheesy decor. It’s almost homey. The “about” page of the chain’s website says they try to impart some of the feel of the founding family’s native state of Zacatecas, Mexico. I went for the tilapia special, a mere $6.99, which was advertised twice near the cash register, once as a “daily special,” the other as a “yearly special.” What’s that about? The clerk laughed and said they’d been serving the dish for so long, they’d decided to joke about it. 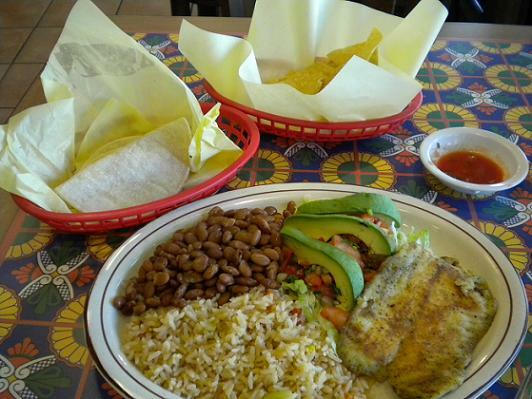 A piece of grilled fish, rice, beans, a little salad, plus tortillas, chips and salsa arrived at my table a few minutes later. No complaints, and a lot of food for the dough. If Fontana’s too far, there are Tio’s at 7305 Day Creek Blvd. (at Base Line) and at 10451 Lemon Ave. (at Haven) in Rancho Cucamonga, not to mention 19009 Van Buren Blvd. in Riverside. 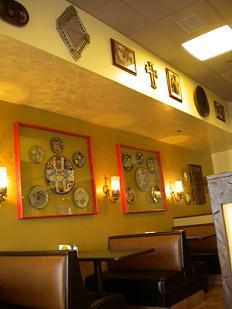 Hope you get a chance to check out Fattoush’s Mediterranean Cuisine in Claremont. They are now open and have some great food! They are located in the Claremont Promenade (formerly the Claremont Auto Center) just south of the 10 freeway at the Indian Hill exit. Why don’t you review restaurants in Chino Hills and Chino? Seems like you spend a lot of time in Fontana. Tio’s looks like a place my husband and I will have to try! Any news on why Honolulu Harrys in Chino has closed?